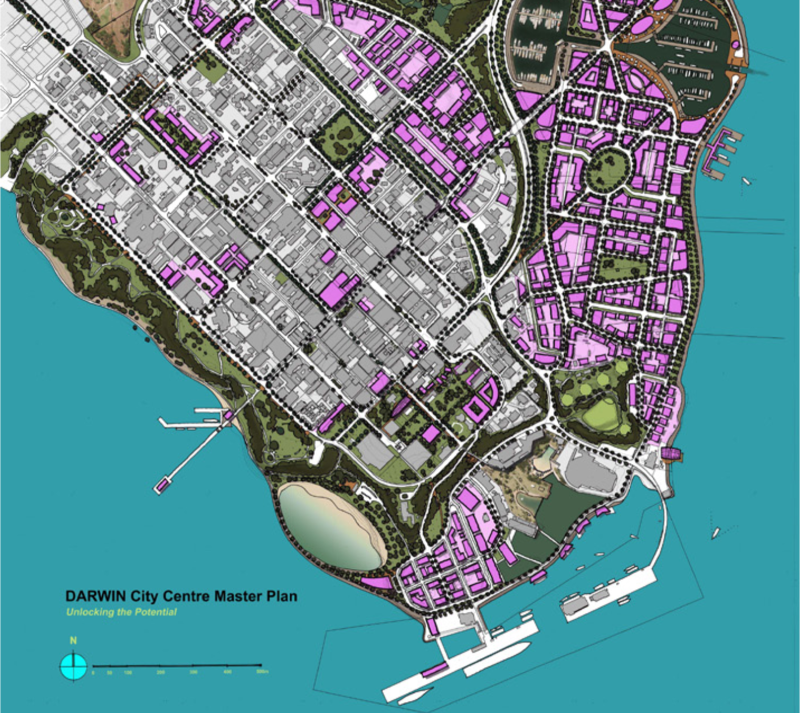 In 2012 the City of Darwin secured a grant from the Commonwealth Government of Australia to produce a Masterplan for the City Centre of Darwin. The purpose of this plan is to provide a road map for development of the city for the next twenty years. To accommodate growth, the City Centre needs to be extended and reinforced. Space Syntax was asked to join a design team led by Design Urban. Our role was to provide comprehensive urban analysis and strategic design input to support the creation of the Masterplan. A key aim of the project is to facilitate private sector investment and population growth through the production of high quality public realm. Data related to Urban Form (e.g. land use, transport and spatial form) and Urban Performance (e.g. pedestrian and vehicle movement, land value) were collected and analysed using Space Syntax software. Associations between Urban Performance and Urban Form were analysed in order to provide an Urban Diagnosis from a number of perspectives; spatial, physical, economic and human behavioural. Opportunities and constraints analysis was undertaken using the Urban Performance Model to develope a Spatial Design Strategy. This strategy, including as set of design objectives and principles, has guided the development of the Masterplan design. Option testing using Spatial Accessibility Models played an essential role in the design development process not only to assess design outcomes quantitatively but also to generate new design ideas and options. Frequent and direct communications with the design team, including attendance at workshops in Darwin were key to maintaining a dynamic design process and ensuring an integration between the baseline analysis and the development of the Spatial Design Strategy. Forecast models for pedestrian movement and for land value were constructed to quantitatively evaluate the impacts of the proposed designs. The outcomes provided useful indicators of the social and economic performance of the Masterplan. 3D visualisation of the Masterplan in static and animated formats were created by Space Syntax and used in the stakeholder engagement process. Such visual representations of the Masterplan were effective in engaging the widest possible audience. Space Syntax’s work has underpinned the creation of the Darwin City Centre Masterplan. Quantified indications of its social and economic impacts have facilitated meaningful discussions between different disciplines, bringing architects, transport engineers, planners and politicians together with a wide stakeholder base. Modelling of the proposed Masterplan, demonstrating how its layout reinforces the Existing City Centre while creating a local centre in the new Extension Area. Night-time rendering of the 3D model created by Space Syntax.